Functional Magnetic Resonance Imaging (fMRI) is a special type of MRI that makes it possible to watch different areas of a person's brain while they do different tasks. 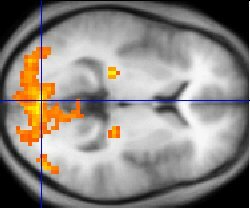 A Functional MRI shows the use of oxygen in different brain areas. The Deoxyhemoglobin in blood absorbs a radiowave signal and later emits it (sends it back out). Oxyhemoglobin does not. When an area of the brain is active, the blood flow to that area increases and more oxyhemoglobin is delivered to supply the active cells with oxygen. This means less of the signal is absorbed. An active area of the brain absorbs and emits less energy than a less active area. This can be seen live as it is happening when different areas of the brain 'light up' on the images as they become less active. This page was last changed on 25 May 2017, at 16:24.